That being the case, I spend some portion of every day (okay, most of every day) hunting for the cutest little baby things. Do I need them? No. Little dude has plenty of little dude things. This is purely mama excitement happening. Either way, I find myself looking at baby crochet patterns all. the. time. Because why wouldn’t I? So instead of just pinning them all to my Pinterest boards (which I’m also doing, let’s be honest), I decided to compile a little roundup list for ya here! If for no other purpose than to satiate any other crafty mama out there that can’t get enough. 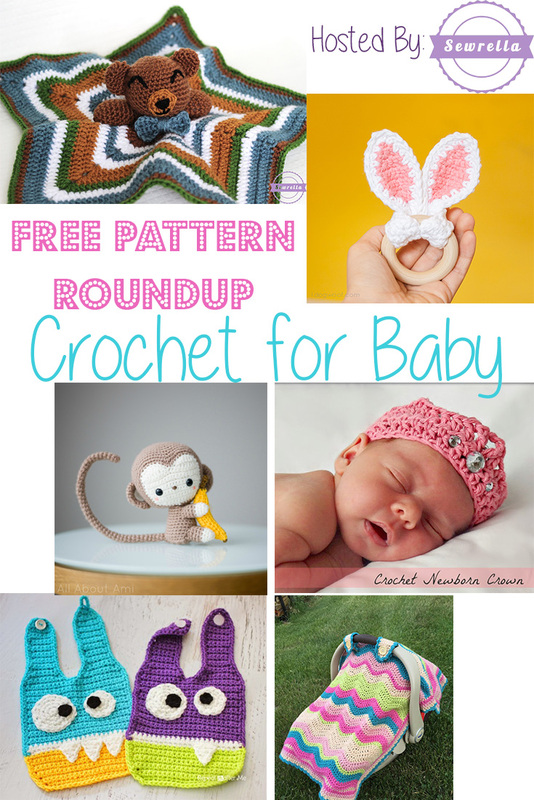 Check out all of the adorable, FREE crochet for baby patterns below! How stinking cute are these? Tiny toes are among the cutest things on planet Earth but tiny toes in tiny crochet sandals?? GET OUTTA HERE. Whistle & Ivy has this baby shoe thing down. Babies need a rattle. It’s like a main law of nature. And this little Ted from Is It a Toy fits the bill! Babies love to scratch their little cheeks and with sharp little nails they can really do some damage (mostly to their mama’s hearts as we can’t stand to see that perfect little face we made all clawed up). So these mittens from Oombawka Design are the perfect thing! If you’ve been on the internet or in a craft store at all in the past five years, you’ve seen the chevron style. It’s everywhere and for good reason – it’s dang cute! I love the colors in this one from Vivaciously Vintage, and it’s super simple too! Babies drool. Babies need bibs. Why not crochet some monster bibs? That’s right – there is no reason not to! Boy or girl, these little guys from Repeat Crafter Me are too cute not to make. All About Ami has created what is possibly the cutest amigurumi monkey ever! My family always calls the babies “little monkeys” so this is going on my must make list! Baby socks are cute, and baby shoes are cute. But baby crochet sneakers are possibly the cutest. Just look at those little kicks – adorable! Loopysue designs nailed it. I’m a huge fan of One Dog Woof, she has tons of cute patterns for baby and kids but these little bunny ear teethers really got me! No doubt my little man will have these when those little chompers start coming in. Ok, how sweet is this picture? That little crown is getting me feeling some kinda way. And a blue one would be perfect for a little prince! Domestic Bliss Squared has achieved photo prop perfection here! Little newborn eyes are oh so sensitive to the sun’s bright rays, especially here in Florida. And after shopping around for these car seat canopies, I’ve found that there are none on the market cuter than this crocheted one from Skein and Hook – adorable! I had to throw my cuddly crochet bear lovey on this list, simply because I’m still obsessed with him! He’s quick and easy and one of my favorite makes yet! Don’t forget to PIN this post so that you don’t lose it! Well I do hope this list has helped to jump start your inspiration for baby crocheting – there are so many beautiful patterns out there. Which will you start on soon?